16 Oct How to achieve balance and posture perfection using yoga? The topic for the Hindi Satsang on Sunday, 28th July, 2013 was 'Balanced State of Mind. 'Following is the transcript of the speech made by Smt. Hansaji Yogendra on the topic. Listen to the Audio: If you can not see this chirbit, listen to it here http://chirb.it/BzvcAI Check this out on Chirbit"Let's understand our role in any situation, how we can help ourselves maintain a balanced state of mind. While we perform our work, others too perform their own work. Everything has its own place, everything has its own need, that’s why it's there. So we should carry on. And carry on happily, carry on with joy, with enthusiasm. Be very creative, find out (for yourself) in the same very situation, what can you do, so that you may still enjoy it more and so on.Maintaining a balanced state of mind should be our primary goal, that no matter what happens, I should not lose my balance. This means that I have to practice self-discipline; like a watchman who does not allow bad elements to enter, similarly I have to watch myself and not allow any thoughts that may make me lose my balance. But for that, I have to attend to many areas. 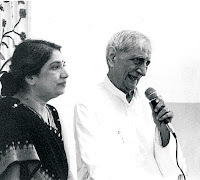 The topic for the Hindi Satsang on Sunday, 28th July, 2013 was 'Balanced State of Mind. 'Following is the transcript of the Q & A between the audience and Dr. Jayadeva Yogendra and Smt. Hansaji Yogendra. If you can not see this chirbit, listen to it here http://chirb.it/BzvcAI Check this out on Chirbit"Let's understand our role in any situation, how we can help ourselves maintain a balanced state of mind. While we perform our work, others too perform their own work. Everything has its own place, everything has its own need, that’s why it's there. So we should carry on. And carry on happily, carry on with joy, with enthusiasm. Be very creative, find out (for yourself) in the same very situation, what can you do, so that you may still enjoy it more and so on.Maintaining a balanced state of mind should be our primary goal, that no matter what happens, I should not lose my balance. This means that I have to practice self-discipline; like a watchman who does not allow bad elements to enter, similarly I have to watch myself and not allow any thoughts that may make me lose my balance. But for that, I have to attend to many areas. Check this out on ChirbitQ. During illness, the mind tends to lose stability and tends towards negativity. How can this be avoided? Dr. J: Well, remember the name of God as often as you can, try to recollect certain good sentiments. Little, little tips like that can help. Smt. H: Remember that this illness is also temporary, this shall also pass and after every illness, body and mind become stronger. I have seen that even children, after an illness, look more grown-up. Illness doesn’t harm, to come out of it, we develop more strength. So take illness positively, not negatively; the mind should not get disturbed.Q. Why is it that sacrifice and control is only for the woman; like Sati, divorce, woman touching man’s feet, woman going to husband’s house after marriage? Man can marry several times, is it because man is physically stronger and generally financially strong? The topic for the Hindi Satsang on Sunday, 28th July, 2013 was 'Balanced State of Mind. 'Following is the transcript of the speech made by Dr. Jayadeva Yogendra on the topic. Check this out on Chirbit“The main objective in yoga is a balanced state of mind. This is what we don’t understand. Any little event can disturb, any statement can upset us and most of the time we are in that condition.